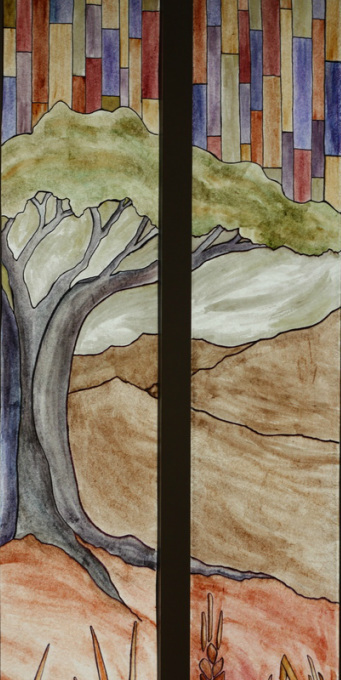 This stained glass art project was initially inspired by a passing comment that John Coe made in a sermon about how wonderful it would be to have stained glass images in the windows of our Sanctuary. Melissa Rose, a leader on our Redeemer Arts Council, picked up on this comment and begin to envision a way to make this happen that wouldn’t cost the church thousands of dollars. A group of us met in January to plan and choose a theme. We decided to focus on the story of salvation as it is seen in the varied aspects of creation, which have, in many ways, become symbols for us as we think about our relationship with God. When you look at these windows, think of them as a movement, or story. The story of salvation lies between two trees: the Tree of the Knowledge of Good and Evil, and the Tree of Life in Heaven. At the center of our sanctuary we can see the Cross. This cross rises above us in our service each week, reminding us of where our hope comes from. On that tree, our Savior Jesus died, allowing us to be released from the curse that resulted from disobedience at the first tree in the garden, and gave us eternal life with Him on a renewed earth, where we will see the Tree of Life with our own eyes. Our desire was to create a space where we as a congregation sat both metaphorically and physically between two trees, looking to Christ’s action on the cross to bring us from one tree to the other. That is why a man leaves his father and mother and is united to his wife, and they become one flesh. Adam and his wife were both naked, and they felt no shame. After forty days Noah opened a window he had made in the ark and sent out a raven, and it kept flying back and forth until the water had dried up from the earth. Then he sent out a dove to see if the water had receded from the surface of the ground. But the dove could find nowhere to perch because there was water over all the surface of the earth; so it returned to Noah in the ark. He reached out his hand and took the dove and brought it back to himself in the ark. He waited seven more days and again sent out the dove from the ark. When the dove returned to him in the evening, there in its beak was a freshly plucked olive leaf! Then Noah knew that the water had receded from the earth. He waited seven more days and sent the dove out again, but this time it did not return to him. Then God said to Noah, “Come out of the ark, you and your wife and your sons and their wives. Bring out every kind of living creature that is with you—the birds, the animals, and all the creatures that move along the ground—so they can multiply on the earth and be fruitful and increase in number on it.” So Noah came out, together with his sons and his wife and his sons’ wives. All the animals and all the creatures that move along the ground and all the birds—everything that moves on land—came out of the ark, one kind after another. Then Noah built an altar to the Lord and, taking some of all the clean animals and clean birds, he sacrificed burnt offerings on it. The Lord smelled the pleasing aroma and said in his heart: “Never again will I curse the ground because of humans, even though[a] every inclination of the human heart is evil from childhood. And never again will I destroy all living creatures, as I have done. So Ruth gleaned in the field until evening. Then she threshed the barley she had gathered, and it amounted to about an ephah. “I am the true vine, and my Father is the gardener. He cuts off every branch in me that bears no fruit, while every branch that does bear fruit he prunes so that it will be even more fruitful. You are already clean because of the word I have spoken to you. Remain in me, as I also remain in you. No branch can bear fruit by itself; it must remain in the vine. Neither can you bear fruit unless you remain in me. “I am the vine; you are the branches. If you remain in me and I in you, you will bear much fruit; apart from me you can do nothing. If you do not remain in me, you are like a branch that is thrown away and withers; such branches are picked up, thrown into the fire and burned. If you remain in me and my words remain in you, ask whatever you wish, and it will be done for you. This is to my Father’s glory, that you bear much fruit, showing yourselves to be my disciples."